Lights, Camera, Action! The British Film Institute’s annual London Film festival starts rolling this week until the 20th of November. To commemorate the role cinema plays in London life, this week’s poster is Marc Severin’s, Why wait till later,1938 – a poster which perfectly depicts the golden age of cinema while also delivering a key travel demand management message. Born in Brussels, the son of a poet, Marc Fernand Severin studied philosophy and letters, then art and archaeology at Gent University. He lived in England from between 1932-40 and 1945-9, first working as art director of R C Casson advertising agency, then as a freelance artist, advertising designer and book illustrator. He engraved over 100 stamps, winning first prize for his George VI stamps. He taught at the Institut Superieur des Beaux Arts, Antwerp (1949-72), where he became Professor of Engraving, and at the Institut des Hautes Etudes Typographiques Plantin, Belgium (from 1956) where he became Professor of Graphic Design. Marc Severin produced a series of posters for the Underground designed to ease congestion during rush hour. Each poster recommends the enjoyment of leisure activities at peak times to ease the after work rush and uses a clock fashioned out of a roundel to illustrate this activity. This particular poster in the series suggests going to the cinema straight from work instead of making a journey back again later in the evening. 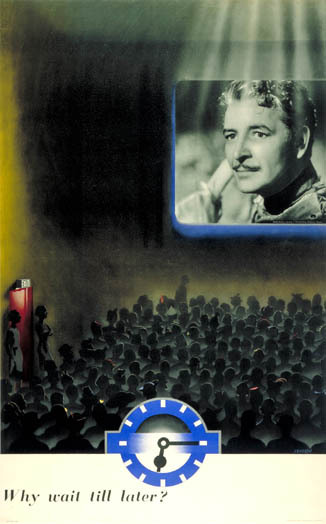 The poster neatly ties together illustration and photography; merging Severin’s drawing with a still image from ‘If I were a King’; a popular film from 1938 that featured the well known English actor Ronald Colman. The inclusion of the film in the poster demonstrates the neccesary requirement for these posters to be culturally relevant while also communicating subtle instructional messages. Severin’s Why wait till later remains a celebration of the Capital as a cultural centre which continues apace through festivals such as the BFI film festival.